The Acer Aspire One D260 netbook is sort of what you would get if you crossed an Aspire One 532h with an Aspire One D521. If that doesn’t mean anything to you, all three netbooks are 10 inch machines with 1024 x 600 pixel displays and low power processors. But like the 532h, the Acer Aspire One D260 has an Intel Atom processor and GMA 3150 graphics… but it has almost the same case design as the Acer Aspire One 521 (which has an AMD chipset instead). The folks at Laptop Magazine took the new Aspire One D260 for a spin and found that it performs pretty much as you’d expect a netbook with an Intel Atom Pine trail processor. And that’s not a bad thing at all, given the low $299 price tag for this model. 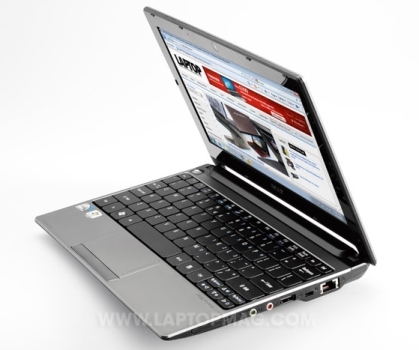 The netbook also has a 1.83GHz Intel Atom N470 processor, 1GB of RAM, a 250GB hard drive, and 802.11b/g/n WiFi. There’s no Bluetooth, and the 6 cell battery lasted for about 5 hours in Laptop Mag’s test. That’s below average for an Atom powered netbook, but 5 hours really isn’t that bad for any laptop at this price point (although there are models such as the Asus Eee PC 1001P which get much better battery life and cost about the same). For more details, check out Laptop Magazine’s review. It’s worth pointing out that while we’d seen reports suggesting that this model would be available with Google’s Android operating system running alongside Windows 7 Starter Edition, it doesn’t look like Acer is offering that configuration at the moment. i have the laptop, and i’m on it right now, i love it. looks better than most netbooks, i didn’t like that it had Windows starter, but i quickly took care of that and now have ultimate. that would be my only complaint out of of the box. its has the multi-gesture , which is just like the iphone. all in all love it. Hi. I bought one also last Saturday and immediately changes the OS to Win7 ultimate. Managed to download all drivers from Acer website and everything else worked fine except the mutli gesture though i already installed the driver. Can you tell me how you managed to have the mutli gesture working after the upgrade to ultimate. Thank you. Are Acer Aspire One D260 and Acer AOD260 the same? Or are they different? Just got the Acer Spire One D260. Seems slow to me…How can I speed it up…I don’t know much about computers but would the Windows Ultimate upgrade help with that? hi has anyone tried to upgrade the ram to 2gb? i did it, 2 gb chip from kingston memory was over $100. this is not the regular ddr2 chip, they use special ddr3-netbook memory. ddr3 laptop memory won’t do the trick. you have to remove the keyboard first, separate the flat cable, take out the 3 screws which hold the bottom part of the case, and than separate the power part from the case with a scredriver. there is no other way to get to the memory slot. was a lot of work but worth it. are aceraspire one 260-PU and are aceraspire one 260-Duu the same?? ?